At first glance, this theme has little relevance for Queensland teachers in 2018. Queensland is the first state in Australia to have a universal system of teacher registration based on minimum qualifications that have changed and increased with the times. Teacher qualification is a fundamental tenet of the QTU. We fought against the employment of “eight-week wonders” – teachers employed with eight weeks training – in 1968. We’ve opposed the Teach for Australia model, which would have required the standards for entry into teaching to be lowered in Queensland. Australian teachers, and Queensland teachers in particular, are among the best qualified in the world – but they are not treated that way. Most of the rest of the world would kill to have a teaching workforce like Queensland has. The international theme for World Teachers’ Day reminds Queensland to appreciate what it has, what we have worked so hard to achieve. November is Workload and Wellbeing Assertiveness Month for the QTU. 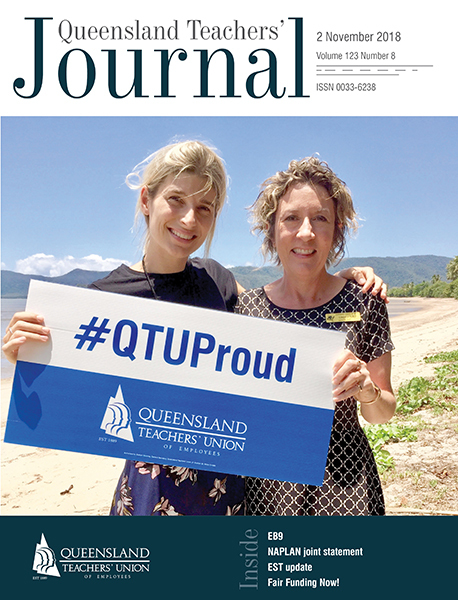 As I was writing this editorial, the QTU was conducting a major workload survey as part of the campaign to address excessive workload and work intensification. Rebecca is a primary school teacher who, after completing the survey, was moved to write to me about workload intensification and useless work. She gave several examples, but the killer for me was new assessment rubrics, mandated, that take longer to agree before you even start to mark scripts than it used to take to mark! And then it took 20 minutes to mark each child’s 40-minute writing task! For those old enough to remember the board game Squatter (and I think Rebecca is experienced enough as a teacher to remember), how many sheep stations are riding on this? It’s madness! What this tells me is that a teaching service to die for internationally is not trusted, and therefore not respected. And the policies of those who do not trust and respect teachers is to introduce accountability regimes that standardise, homogenise and impose time-consuming practices that benefit students not at all, that take away from teachers the professional judgement and decision-making needed when that very non-standard, non-homogeneous group of students turns up every day. Professional autonomy is not school autonomy. A school can have autonomy without its teachers having professional autonomy. The irony is that the international consensus is that the key to better student outcomes is, you guessed it, professional autonomy exercised by professional teachers. Education policies based on lack of respect and lack of trust are counter-productive (if the outcome you’re after is better education). And how does this happen when, all the time, governments and bureaucracies are talking about devolution and autonomy. I’ll mention a statement by Dr Mary Bousted at the International Summit on the Teaching Profession in Wellington in 2014. Mary said: “The more they devolve, the more they want their hand on the tiller.” In other words, the more they devolve, the more they load up accountability regimes that in practice stop you from achieving better results for students. We have a commitment from the Palaszczuk government to a review of teacher and principal workload during this term of government. Let’s put more professional autonomy and respect back into teaching.